The Department of Agriculture and Food Western Australia (DAFWA) and The University of Western Australia (UWA) are leading research into breeding flavonoid-rich apples – healthier apples for consumers. The national project is focussing on aspects of the breeding process and the market knowledge required to deliver a healthier apple to the consumer. Define the knowledge and capacity required to selectively breed flavonoid-rich apples. Define the knowledge and capacity required to identify markets and pathways to that market for a flavonoid-rich apple. Flavonoids are natural compounds, often called antioxidants, which are concentrated in some plant foods. There are more than 3000 naturally-occurring flavonoids, and the dietary effect of each is known to be different. 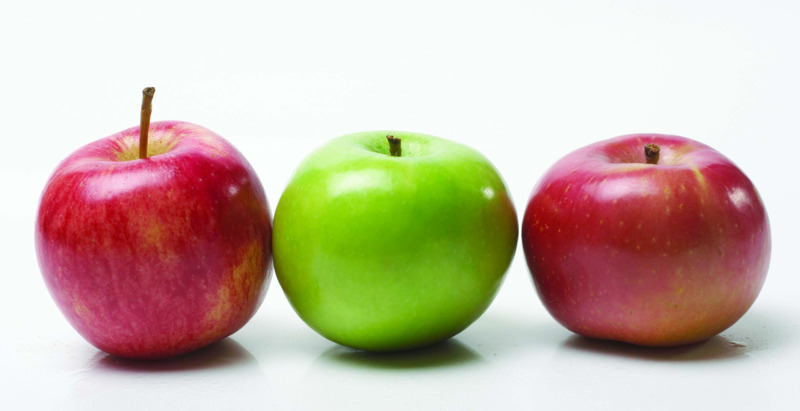 Flavonoid content varies widely between apple varieties and between the types of tissue of an apple. Flavonoids tend to be higher in the peel rather than the flesh of apples and are higher still in the peel of darker, redder and bluer apples. Apples are particularly high in the flavonoid quercetin, which has been the subject of research into the health benefits of flavonoid consumption. There is increasing evidence for flavonoids role in preventing major chronic diseases such as cardiovascular disease, type II diabetes and a number of cancers including pancreatic, colon, liver, breast, prostate and lung cancer. Early studies have also shown a protective effect by apple flavonoids against neurodegenerative diseases such as Alzheimer’s and Parkinson’s. Local studies carried out by UWA scientists have shown that flavonoid-rich apples have a direct and measurable effect on human health; with the consumption of high-flavonoid apples improving several measures of cardiovascular health. One study concluded that dietary flavonoids could play and important role in the prevention of cardiovascular disease. The Australian National Apple Breeding Program (ANABP) is managed by DAFWA and based in Manjimup. This Program has developed several apple varieties including the world famous Cripps Pink (Pink Lady™) and has recently released ANABP 01, an attractive dark burgundy apple unlike any other on the market. In screening of seven commercial apple varieties Cripps Pink was found to have the highest flavonoid levels and ANABP 01 equivalent high levels. ANABP varieties have been bred by traditional breeding methods, involving the crossing of parent varieties with hand and spray pollination. The apples are bred with the aim of maximising certain traits, initially eating quality, appearance, storage ability and pest and disease resistance. Maximising fruit nutrient content is increasing in desirability and project staff are looking into how to breed future varieties with high flavonoid content with the other positive traits. Market research led by Professor Mazzerol is also testing consumer appetite for apples with enhanced levels of flavonoids. Initially the research will look at how apple consumers think. Working with focus groups; consumer attitudes and preferences for flavonoid-rich apples will be investigated, with specific focus on consumption and likely demand and attitude towards the new ANABP 01 variety. Online consumer panels will help determine preferences of different consumer segments in regards to apple factors such as health benefits, taste, appearance and price. Plant breeders and geneticists from ANABP and researchers from UWA’s Schools of Plant Biology as well as Medicine and Pharmacology are involved with this project. UWA staff include Dr Michael Considine from the UWA Institute of Agriculture as well as Prof Jonathan Hodgson, Prof Kevin Croft, Dr Catherine Bondonno and Prof Tim Mazzerol. DAFWA team members are Kevin Seaton, Fucheng Shan, Kevin Lacey, John Sutton, Steele Jacob and Elizabeth Blincow. The project is also supported by national and state industry associations Apple and Pear Australia Ltd (APAL) and Pomewest.